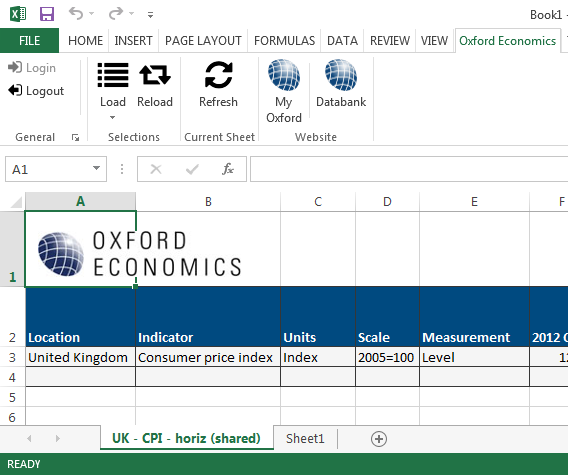 The Data Workstation Excel Plugin is a simple tool which can be used to retrieve data from the online Oxford Economics Global Data Workstation directly into Microsoft Excel. The process begins by making one or more data selections in the online workstation and saving them as individually named “saved selections” (SSs). 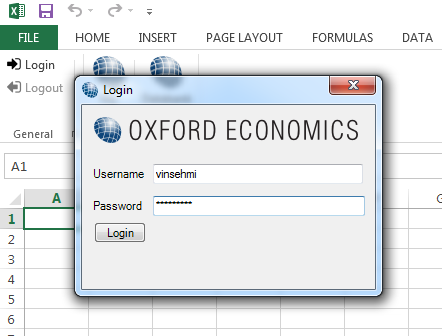 In Excel you can use the Oxford Economics menu login command to connect the plugin to the online data workstation. This allows the plugin to retrieve your saved selections. When you choose a SS to download, its data is obtained from the online workstation and loaded into a spreadsheet. A new spreadsheet will be created for each new downloaded SS. 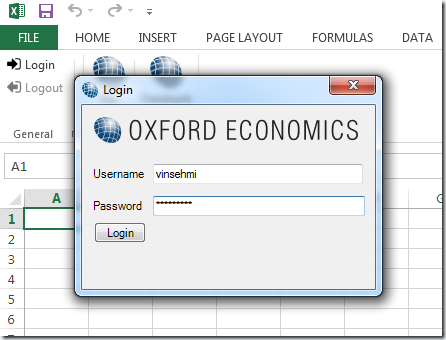 The Excel workbook can then be saved and opened again at a later date. A previously downloaded spreadsheet can be selected and refreshed with the latest data from the online data workstation using the refresh ribbon command. 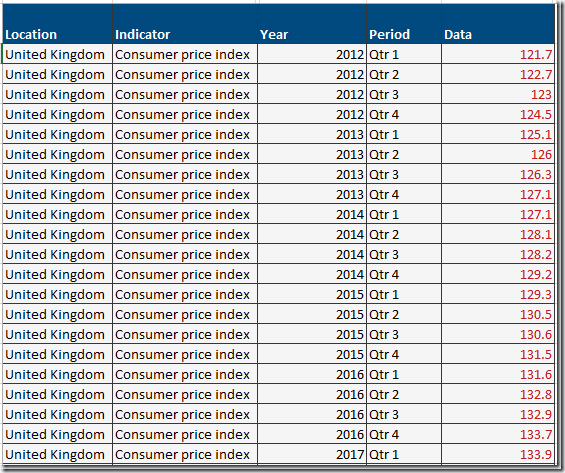 Reference links to any dependent spreadsheets and charts will be kept intact to reflect refreshed new data. You will only have to log in once. Your credentials will be remembered between Excel sessions. If you Log out you will, of course, have to log back in. This logs you out of the Excel plugin application without affecting any Oxford Economics services you are already logged into. The About window is activated by clicking the down arrow in the bottom right hand corner of the General section. 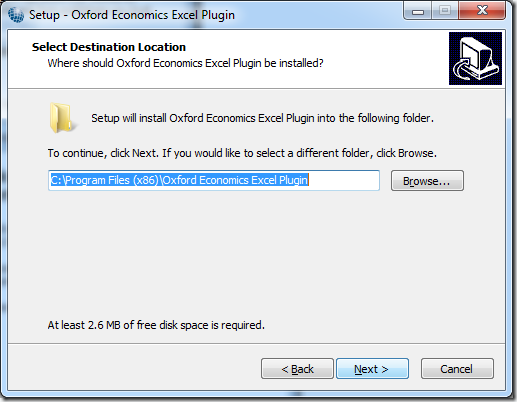 This will show you the version of the Excel plugin installed on your computer. 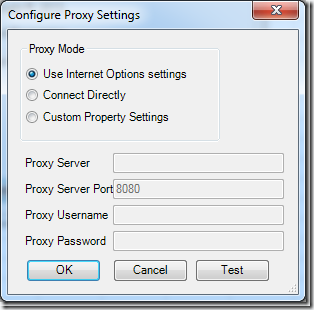 If your access to the Internet is mediated through a proxy, then you must complete the settings in this dialogue box. If the plugin is unable to get an internet connection to log in, then there’s a good chance your network is behind a proxy. Please ask your company’s IT department for assistance configuring these settings if you’re unsure. 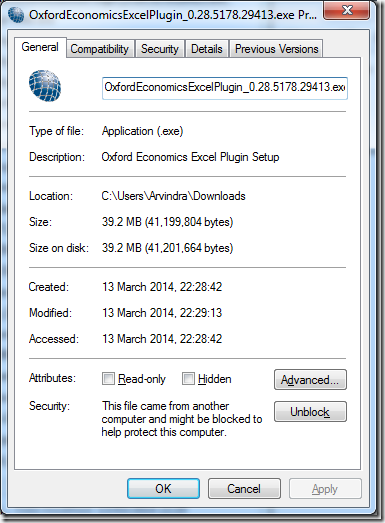 This command shows a window with technical information which is useful for Oxford Economics technical support. 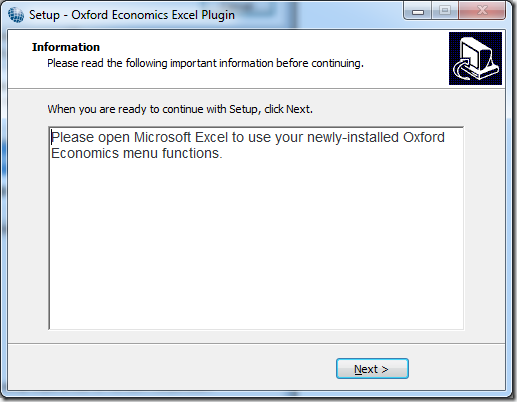 If you’re having issues using the tool, cut and paste the text into an email and send it to support@oxfordeconomics.com. 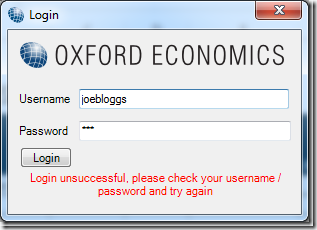 Takes you to the My Oxford section of the Oxford Economics website. This button reloads the list of saved selections. 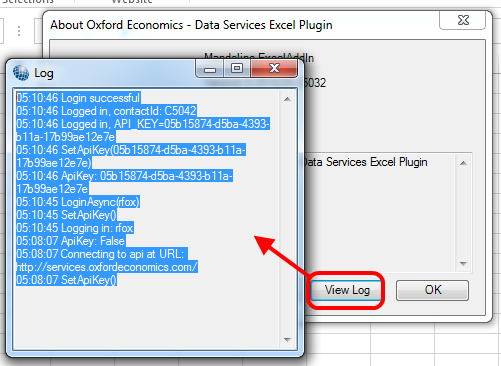 This is useful if you add or remove SSs from the databank and want to see the updated list in the plugin. To use this command you must first have saved selections under your Databank account. If you don’t the button will not be shown disabled on the toolbar ribbon. If the button is disabled, please go to the Databank and create a couple of saved selections right now before proceeding. Once you’re done, click Selections | Reload. Selecting one of these saved selections will bring up a form to configure the download. The plugin provides a couple of download table formatting options and a couple of data layout (shaping) options. The shaping options will be applied in addition to any shaping option already associated with the saved selection. 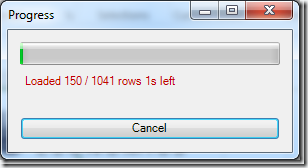 The data folding option creates a skinny table with one column of Years and one column of Data values. 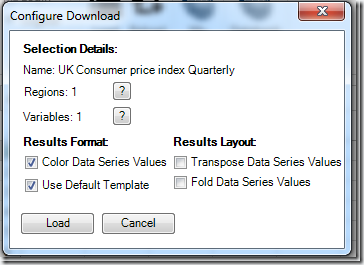 This layout is ideal for importing data into third-party tools like Tableau Desktop and Microsoft PowerPivot. A progress bar with estimated time for download will keep you occupied during big downloads. In addition, you may be warned when using the default template that it could take some time to format the data. Your experience will vary depending on the size of your selection and power of your computer. The saved selection loads into a spreadsheet. The name of the sheet will be the same as the saved selection name. A new section Current Sheet appears in the ribbon menu. The active sheet can be refreshed in situ. 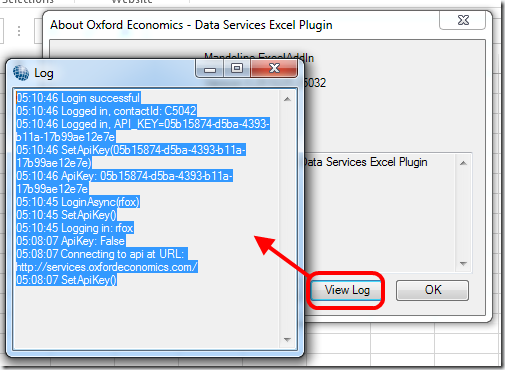 The purpose of this feature is to allow you to take a dependency on the sheet in other sheets, external workbooks or applications. When the plugin detects an active sheet is backed by a saved selection, the Current Sheet | Refresh button appears in the ribbon allowing you to refresh it. This button won’t appear if the active sheet doesn’t contain data downloaded from a saved selection. 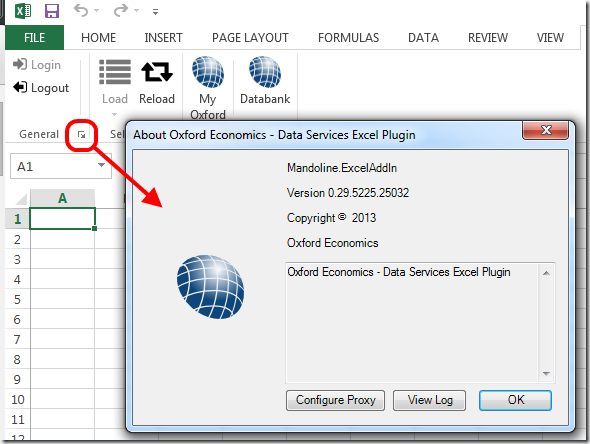 It is therefore possible for Databank-connected spreadsheets to co-exist with regular spreadsheets in the same Excel workbook. The tool requires Microsoft Excel for Windows. 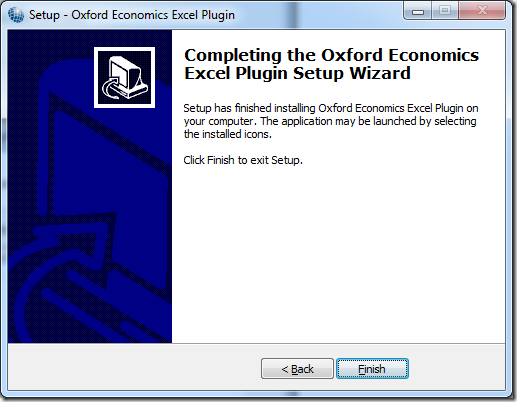 It works in both 32-Bit and 64-Bit versions of Excel 2007, Excel 2010 and Excel 2013. 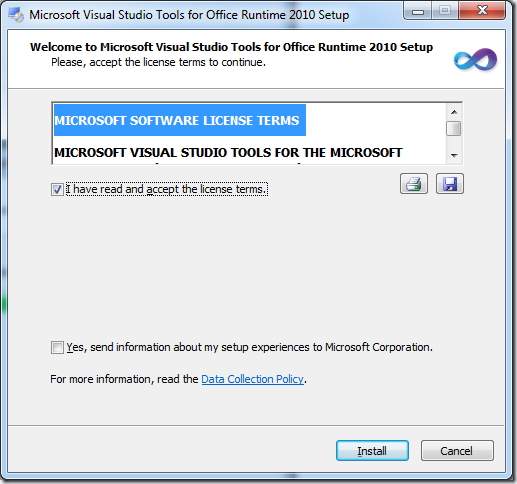 It requires .NET Version 4.5 and Visual Studio Tools for Office Runtime 2010. These prerequisites will be installed during the installation procedure if you don’t have them installed already. You must have Administrator privileges on your computer to install .NET 4.5 and VSTO 2010. If you do not have these privileges, please contact your company’s IT helpdesk for assistance. Oxford Economics unfortunately cannot help you with this particular issue. 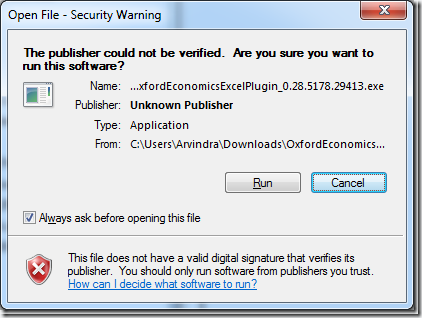 The plugin has been tested on Windows 7 and Windows 8. It will not work on Windows XP due to the dependency on .NET 4.5. 2. Right click the file and select Properties. Click Unblock to authorise this downloaded file. Click OK.
4. If you hadn’t Unblocked the file you will get a security warning when you open it. It is safe to click Run. 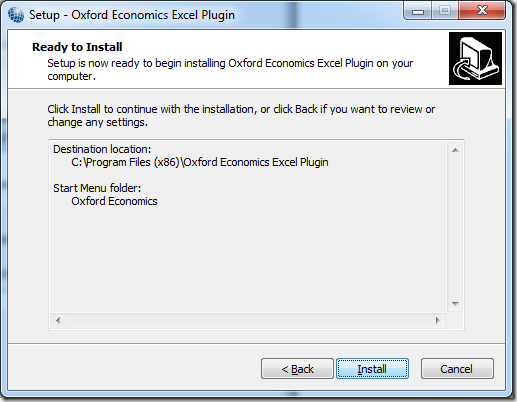 If you run into issues installing this tool, which cannot be solved by your company’s IT helpdesk, please contact support@oxfordeconomics.com.